Jazz, ballet, hip hop, tap, Latin, lyrical, acro, breaking… different styles, different music, same concepts. Flexibility, balance, core strength, fluid movements, control and coordination are all fundamental to each dancer no matter the style. Dance Pilates focuses on all of these elements in one dynamic 50 minute class, which is both equipment and mat-based. 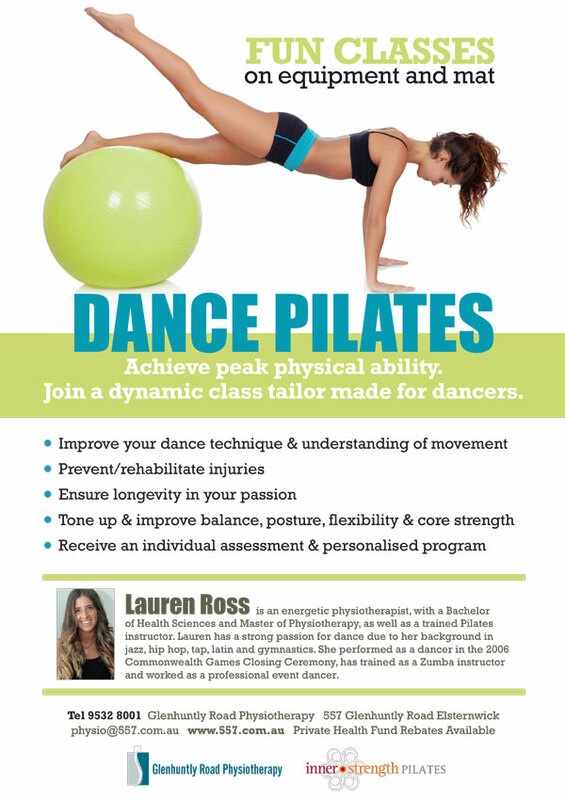 Dance Pilates is run by Lauren our energetic physio instructor who has a background in jazz, hip hop, tap, Latin and gymnastics. She offers individual assessments and personalised programs to achieve your dance goals. Not only will you be preventing or rehabilitating from injuries, Dance Pilates can help you improve your dance technique, body tone and awareness, look good and feel great! Phone 9532 8001 to book your spot in our fun classes!